Stand out with this modern and sleek white on white colored lacquer cutter. 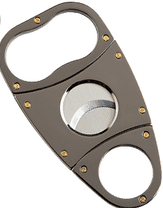 This cutter can snip any fine cigar up to a 62 ring gauge. Crafted with 440 stainless steel.